Munchkin loves my family and we love them. Do you remember when I wrote about how many different products we use from Munchkin? Now we can add two more products to the list. Three if you count the stickers that come with their products. This morning my daughter has been having sticker fun and coloring. I love her artistic flair. She’s just like me. We recently purchased the Munchkin bowls, Multi Bowls. My kids love them and they are perfect for my two year old to eat her cereal. Yes, she uses milk in her cereal, my kids are genius! The Munchkin company sent my family two Wet Wheels, one for us to use and play with and keep. The other to giveaway to on lucky reader. They haven’t made it to the tub yet because I can’t ever find it during bath time. It has been traveling from room to room and has yet to meet the bathroom. It makes noise which delights my son, and it rolls which is also one of his favorite things to do with a toy. It’s like it was made with him in mind. Now your baby’s favorite new bath toy can be his favorite new land toy, too! Wet Wheels™ floats on water and rolls on land for fun everywhere. 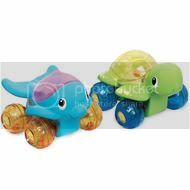 The dolphin and turtle characters have a clear window on their back filled with mini sea creatures, and the wheels are filled with beads for visual stimulation and cool sounds. The body is also soft, so little hands can grasp and play easily. It’s all terrain fun at its best. If you enter this giveaway you need to know that my daughter grabbed the giveaway item and ripped the packaging a little. I didn’t have it out of reach so it’s my fault. The product is just fine and still attached to the packaging. So if you’re ok with all that then feel free to enter my giveaway. Visit Munchkin and tell me what your favorite product is. I love the Powdered Formula Dispenser Combo Pack. Must have for all mommies! I like their sea and play shopping cart cover. Thanks for the chance. We love love love the harness. In fact, we have two. I refuse the leave the house without one. We have one stashed in the stroller as Little Bit now tends to want to walk more than ride, but the stroller is still darned useful. I have the other stashed in the diaper bag as sometimes hubs has the car (and the stroller) and Little Bit and I want to go for a walk after nap. Perfect product, we couldn’t live without it. BTW, I would love to have a couple of those snack catchers. We can’t find them anywhere local! Drat it all. We are a Munchkin lovin’ family too – have quite a few of their projucts. Well made, not too pricey, perfect for budgeting families! I am a feedburner email subscriber. The snack catchers are neat. Would like them for my grandson. I love the pelican rinser. I like the deluxe auto bottle warmer! I think the Foam Bath Letters and Numbers would be a lot of fun. Thank you! my favorite product is the car bottle warmer – how handy would that be!!! My favorite Munchkin product is the Diaper Duck–we have two! My daughter would love the snack dispensers. I faved you on technorati #1. I faved you on technorati #2. I have always loved the Snack and Serve cups, perfect for the car! The bath letters and numbers are pretty cool! My daughter would love the Dora toddler dishware set. I like the Stay-Close Harness & Handstrap. We have their Duck tub for my daughter and she loves it. She splashes around so much we had to put the duck tub in the regular tub so that everything would not get soaked. Love the Fun Ice Chewy Teethers! The Sea and Learn bath shapes are cool! I like the voice activated crib light! My favorite product is the SpongeBob SquarePants™ 9 oz. Spill-Proof Cup. I also love the Floating Foam Letters! I love the Safety Bath Ducky ~ I was burned (not bad, but enough to remember) as a child and I feel this product is ingenious! The baby food organizer is neat! Thanks for the chance. The snack catcher would be great for us. I like the JELLY BEAN™ REVERSIBLE SLING. Thanks for the giveaway! The Teething Blanket looks like a helpful product! Love Munchkin! Mighty Grip™ 8 oz. Trainer Cup is great! The snack catcher is great! I like the muddy pigs. There are so many great products on this website. The cupsicle is my favorite item. Baby Food Organizer looks like somethng I could really use. I like the Super Scooper. Thank you. My boys would also love the Gone Fishin’ Bath Toy. I really like the Snack Catcher. I love the Stay-Put Suction Bowls the best! I like their snack catcher. It is great! From Bath to Numbers would be perfect for my son. My favorite product is the Gone Fishin’ Bath Toy. We have and love the Snack Catchers. They are perfect for around the house and in the car. I like the Cool Flow™ Back Sleeper. I like the Sesame Street Plush Harness. I eally want to get my son the Gone Fishin’ Bath Toy.Thanks! The Bobble Bee looks adoreable. I love the Soft Animal Stackers! Thanks! I like the twist tight reusable straw cups! the kids love the straws and I love that they have cups with lids! I like the Deluxe Auto Bottle Warmer, that sounds great! I love the Safety SunBlock Shades. We could really use these. The Sesame Street sunblock shade would be great in my car to protect my son! I like the portable diaper caddy because I babysit lots of kids in diapers and this would be so great and easy to get everyone changed. My daughter would love the Dora the Explorer dinnerware set! I really like the safety baby bath cradle. I would like to try the Snack Catcher.